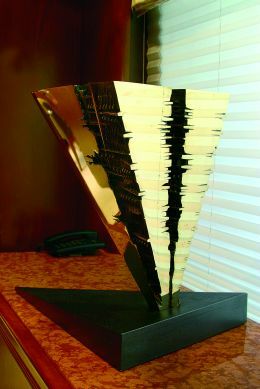 During the 51st International Exhibition of Visual Arts in Venice, in the context of side events, Silvana Mainardis' Venice Design Art Gallery in Calle Vallaresso put on an exhibition by the artist Arnaldo Pomodoro. 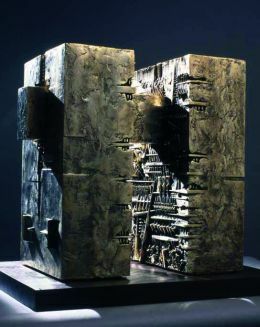 Perhaps not everyone knows that many works by Arnaldo Pomodoro, an artist appreciated worldwide, first "cast off" on cruise ships and superyachts, a fact that underlines shipowners' and seafaring enthusiasts' predilection for this artist. But he himself told us that he has only rarely made long sea voyages and is rather more bound to the land as an element of belonging and protection. His relationship with the sea is complex and implies the great themes of life and death. The item in this exhibition that most struck me was a great work called "Soglia" (Threshold), dedicated to Eduardo Chillida. It's a kind of trilith consisting of two relatively narrow and fairly deep vertical elements joined by a third horizontal element that passes through and is interlocked. The dimensions are such as to allude to an architecture but do not permit a person to pass through as with a real door. What is your relationship with the sea? I was born on the Adriatic coast, between Fano and Pesaro, and I spent a lot of time in Rimini. I'm very familiar with the sea. Though I can swim I hardly ever venture far from the shore. Maybe because an uncle of mine, who had the same name as me, was drowned, sucked under while he tried to swim across the mouth of a river. I remember this event giving me a strong feeling of anguish. I certainly prefer the sea to the mountains and I especially like taking long walks along the sand. What sensations do you get from the sea? I see the sea with a mixture of fascination, amazement and disturbance. It contains a beautiful and mysterious world and it throws up extraordinary things, consumes them, transforms them and I collect them because they are full of meaning, and sometimes the sea gives us "fragments of history". And then, life itself comes from water. What else interests you about the sea? In particular, cuttlebone is a symbol of marine nature for me and was fundamental to my artistic beginnings. It was precisely through the fusion method with cuttlebone, which I learnt in an old goldsmith's workshop in Pesaro in the early 1950's, that I created my first little relief works in lead and silver. Sometimes I set myself to study all the lamellar structures of cuttlebone: their internal texture is extraordinary. Investigating the bone, the veining often suggests almost magical forms, and you need only add a small sign to obtain an original figure. With the cire perdue technique I used for my large bronze sculptures, the cuttlebone function was carried out by clay. In the end it is the earth that gives life to sculpture. What do you like in nature? The first images I recall are the rocks, the crevices and the nature of the marvellous places of Montefeltro where I spent my childhood. Nature, though I never represent it in a traditional way in my works, is an absolute source of inspiration for me. I recall the great emotion I felt in the Grand Canyon, seeing those imposing blocks of stone with rips and fractures, almost as if they were gigantic, extraordinary sculptures. My works usually come from the suggestion of an image. During a trip to the Yemen in 1996 I was struck by the Temple of the Moon in Ma'rib, the ancient capital of Saba: trunks of pillars, not round as in Greece but rectangular. That's where I got the idea for new works, the "Quattro Stele", a group of sculptures I presented the following year at the Rocca di San Leo exhibition. In the gallery I've seen wall panels with smooth surface figures set on a background of small letters: what do these letters represent? The writing of an ideal or lost language. Since my youth I've been fascinated by archaic writing, such as the tablets of the Hittites or the Sumerians, Mesopotamian hieroglyphics, the signs of the Camuni, the first traces of forms of communication between people. My visit to the anthropological museum in Ankara was a memorable and very involving experience. Would you call yourself an abstract artist? Absolutely yes. I studied Paul Klee in depth, a painter who passed from naturalism to abstraction, an artist who like me was greatly affected by Morocco and who, precisely in that country, refined the forms and elements of his works in such a way as to arrive at essential and abstract signs. I really love all of Africa and the Mediterranean countries, in particular the civilisation of the ancient Egyptians who I believe were the first masters of symbolic and abstract expression. 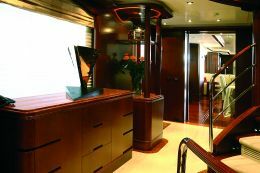 I know that many of my works are on ships and yachts. I'm happy that a lot of people can enjoy both the sea and my works. A short time ago I did a piece specially for a cruise ship, a great sphere set right at the ship's main entrance, as a metaphor of the world which travellers and cruise passengers are seeking and getting to know on their travels. From a general point of view I think that the yacht is a means to be carried with you while sailing, a part of your own things and a "piece" of home and your own history. I prefer to have a place all of my own, like my country house in Lomellina where, when I can, I withdraw to rest and reflect. On a big yacht I recently photographed a fine work of yours, "Prua di nave" (Ship's Bow). Do you recognises it from the photo? Certainly. It's a homage to Federico Fellini. When he died the Commune of Rimini commissioned a work in his memory to be placed in the town cemetery. We were great friends and we met in Rimini, where I studied, when we were young. 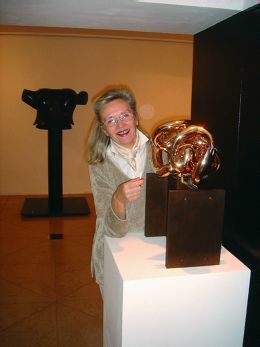 In 1990 in Tokyo we both won the Praemium Imperiale - him for the cinema and me for sculpture - a sort of Nobel Prize for art which includes painting, architecture and music. Fellini, from Rimini, loved the sea as I do, so I thought of constructing a double triangle, twofaced, like an essential, ideal prow, in a bright bronze which, inside, is charged precisely with the stamps and signs of my style, meaning the whirl of life and ongoing research. Why is the bow split? It's split to highlight the mysterious fermentations found within matter, in order to arrive at life and energy. All my works are conceived in such a way as to show the tension and contrast between the exterior and interior of a form. As in the bow, also in this exhibition sculpture dedicated to Eduardo Chillida, I am thinking of the space delimited by the work as if it were a passage that man could follow, a gate which is also a threshold, towards the unknown, like an ideal reference to the extreme passage from life to death.